Read the story of his Hohentwiel at K7MDL Mike´s homepage. Mike is VHF OP and EME specialist. 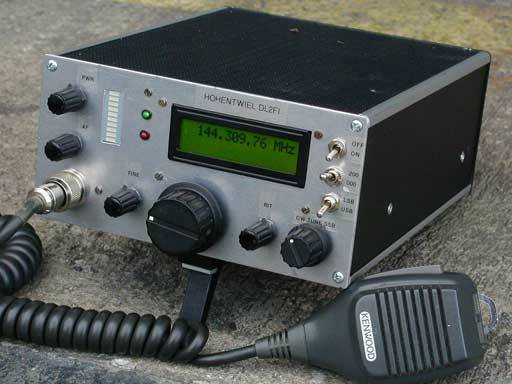 2m SSB / CW only designed for low sideband and phase noise (NO PLL, NO DDS) This helps if you plan to use it wit Microwave Transverters Low current RX, good for portable use. Two Subbands: Lower band 144,0-144,2MHz, Upper band 144,2-144,5MHz) generated by switched VCXO's. Preselektor Frontend helps working from QRA with high RF levels.Low harmonics and spurious withh excellent IM charakter guarant clean signal even with power amplifiers. Stable frequency with excellent noise figures by double Xtals with 5ppm accuracy VCXO. The basic kit contains all PCB,s plus all parts for the PCB,s. Enclosure, peripheral parts are NOT included in the basic kit. Enclosure kit: Enclosure, mountig area, all mechanical part, jacks, knobs, pots. BarGraph S-Meter / power-Meter (The S-Meter shown in the picture is NOT available, if you want to use a needle meter, you must organize it by yourself at a flee market. Basic Kit with for PCB,s all parts for the PCB,s and printed manual. The differences between the 4 basic kits are the type of coils and the quartzfilter. The enclosure kit contains: enclosure, mounting board, mounting parts, RF tight enclosures for RF PCB and VCXO PCB, reday made SMA connectors, Jacks, Pots, 10 turn Pot for frequency adjustment, mechanical display. 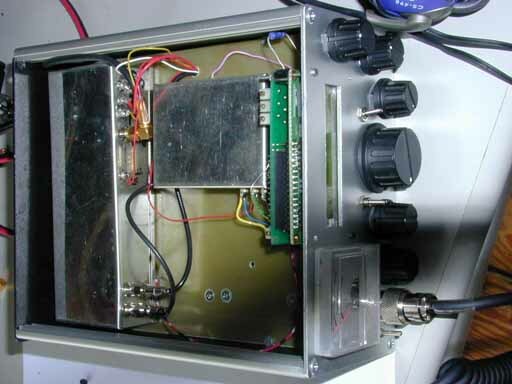 Look inside the Hohentwiel, Left the enclosure for the RF board, right the enclosure for the VCXO board. IF and control board are below the mounting plate.